Cellar Door Archives - Write for Wine: It's Wine O'Clock Somewhere!Write for Wine: It's Wine O'Clock Somewhere! Henschke is a 157-year-old family-owned winery located in Keyneton, South Australia, in the Eden Valley wine region of the Barossa. 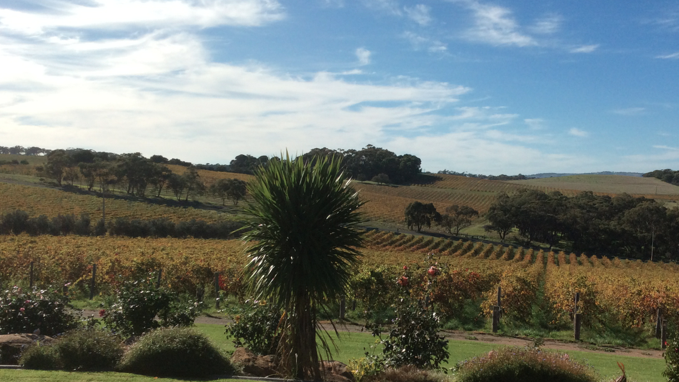 When we were in Australia in May, we received many recommendations to stop by Kay Brothers Amery Vineyards, the oldest McLaren Vale winery still in founding family hands. We are so glad we followed that advice. The diary pages meticulously describe the weather, the vintages and insights into the people, their lives and their hard work. Equally as amazing were the wonderful people we met at Kay Brothers Cellar Door (the Australian term for “tasting room”). In particular, Michelle Taylor entertained us for an hour or more with stories and enthusiasm about the winery’s history and the wine region, as we savored some pretty magnificent pours of Kay Brothers wine. Wow. We became fans of each wine we tasted at Kay Brothers Cellar Door. But our favorite, and the wine we brought home to Seattle, was the spectacular Kay Brothers 2011 Block 6 Shiraz, handpicked from 119-year-old vines. Specifically, this stellar wine was sourced from vines that were planted on July 18, 1892. Known as one of the best Shiraz produced in McLaren Vale, Block 6 Shiraz is robust, rich, complex, structured, smooth and simply beautiful. The outstanding 2011 vintage is the 27th release of this single vineyard wine, produced in the tradition of open-top fermentation and basket-pressing used for more than a century. We also were impressed with Kay Brothers 2011 Cuthbert Cabernet. In wine country known worldwide for Shiraz, it was a breath of fresh air to experience a Cabernet Sauvignon of this quality. The Cabernet vines also go back more than a century but over the years, the grapes were mainly blended with Shiraz for full-bodied Australian Claret. The 2011 is the fourth release of this commemorative wine honoring Cuthbert “Cud” Kay, who was responsible for the development of Cabs at Kay Brothers. (Only made in years when the grapes are deemed worthy, just four vintages have been made so far.) In the family tradition, this Cabernet is rich, vibrant and structured. 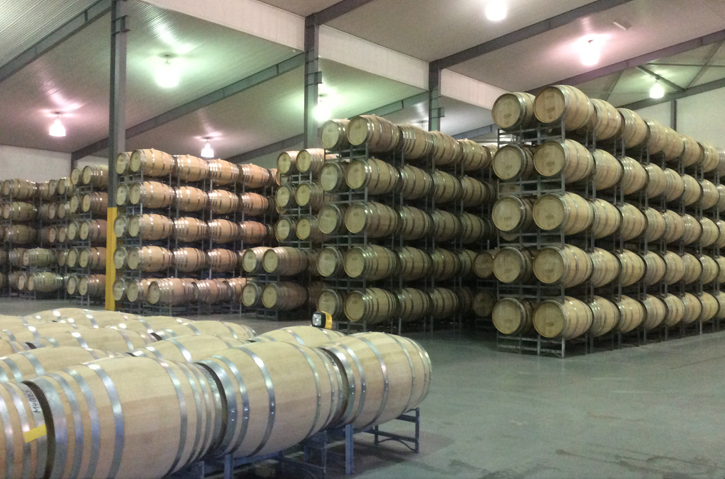 As you can see from the photo at the beginning of this post, Kay Brothers produces numerous other wines too, including Cabernet Merlot, the award-winning Mataro (Mouvedre) and Grenache. 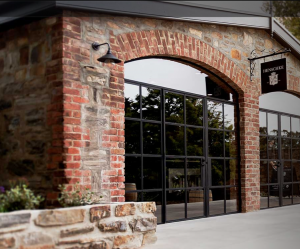 If you travel to Australia, we highly recommend that you make a point of stopping by this outstanding cellar door. You can also buy Kay Brothers wines in the U.S. from distributor Quintessential Wines, and in Canada from Inland Trading. As promised in our previous blog post, Mollydooker-Part 1, we want to share information about Sparky and Sarah Marquis’ unique “Marquis Fruit Weight™,” along with other stories we heard from Sparky’s dad, Leigh Gawith, who is also the vineyard manager. Sparky and Leigh are both pictured on the right in a photo we took during our visit. 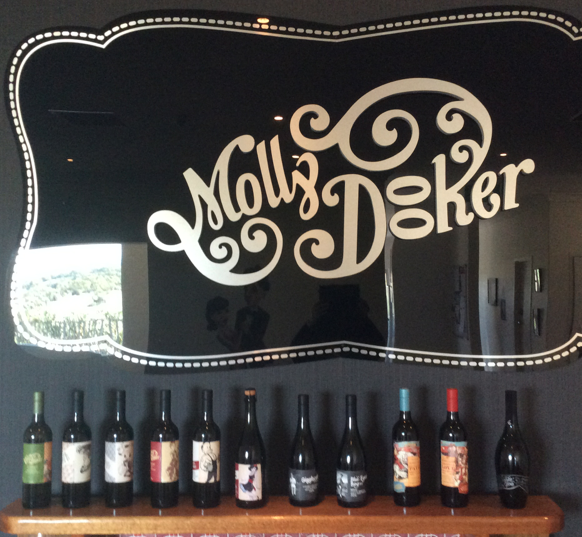 To refresh your memory, we spent a few hours at Mollydooker’s Cellar Door in McLaren Vale, Australia last month; we had so much fun and learned so much that we are writing a second blog post about our experience. Sparky and Sarah began making wine in the 1990s. By 2006, after both challenges and successes, the brand Mollydooker was born. Mollydooker is an affectionate Australian slang word for left-hander, because both of them are left-handed. Three months later, The Wine Advocate chose Mollydooker’s Shiraz, The Boxer, as the Best Value Red Wine in the World. The Two Left Feet (a blend of Shiraz, Cabernet Sauvignon and Merlot) was second, and the Maitre D’ Cab came in fourth. The Violinist (Verdelho) was chosen as the Best Value White Wine in the World. All these wines sold out in nineteen days. In August, Mollydooker’s Carnival of Love was awarded 99 points from The Wine Advocate, while their Enchanted Path received 96 points. They both sold out in five days. 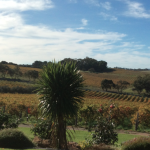 Following these wonderful events, Sarah and Sparky bought 114 acres of vineyards, a winery and property with stunning views on Seaview Ridge in McLaren Vale, 45 minutes outside of Adelaide. Their motto is: “We make wines that make people go WOW, through attention to detail and commitment to excellence!” And if you read Mollydooker-Part 1, you’ll know we said WOW a lot while tasting their wines. Note: This is only part of the Mollydooker story. You can read the entire story on their fun website. So what makes Mollydooker wines unique? Read on! The Marquis Vineyard Watering Programme™ is the result of an intensive collection of data and analysis, starting at bud burst in each vineyard and inspections twice weekly throughout the growing season. To produce the most intense fruit flavors, this program focuses on growing strong and healthy vines with a balanced canopy. 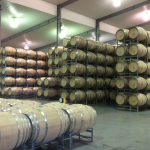 On our vineyard and winery tour last month, Leigh told us the programme is successful because they manipulate water levels to mimic the aging process. This means they can create balance in the vines during one year, instead of what usually takes ten. He pointed to neighbours’ surrounding vineyards to show us the difference in their appearance compared to Mollydooker’s because of this programme. Leigh said the secret is allowing the soil to dry up, so the vines go into survival mode and put more flavour into the fruit. In turn, the amazing fruit flavour achieved in the vineyard is what creates the Marquis Fruit Weight™ in the wine. 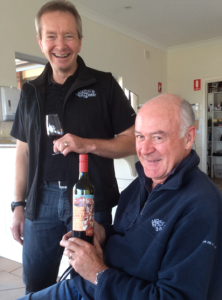 Remember in Part 1, we talked about Mollydooker’s outstanding wine, Velvet Glove Shiraz? Well, Marquis Fruit Weight™ is the “velvet glove” sensation of fruit that sits on your tongue before the structure of the wine is exposed. To get there, Leigh’s vineyard team measures the growth of the vines and reports on the fruit weight of the juice. The data is then fed into complex formulas, which results in precise watering recommendations for the next three days. And on it goes throughout the growing season. Meanwhile, Sparky and Sarah taste and classify the grapes into fruit weights ranging from 65% to 95-100%. The higher the fruit weight, the more intense and rich are the flavors in the wine. These fruit weights determine the price of Mollydooker wines. For example, their $25 wines (Boxer Shiraz) land at 65%-75% fruit weight; the $49 Blue Eyed Boy is 75% to 85%; the Carnival of Love costs $75 and is 85% to 95% fruit weight, and the $185 Velvet Glove is 95% – 100% fruit weight. Unfortunately we didn’t get a chance to meet Sarah when we were at Mollydooker’s Cellar Door. But we’ve seen interviews where she stated that she uses only two words to describe wine, so nobody has to remember all the flavour characters: – Yum or Yuck. 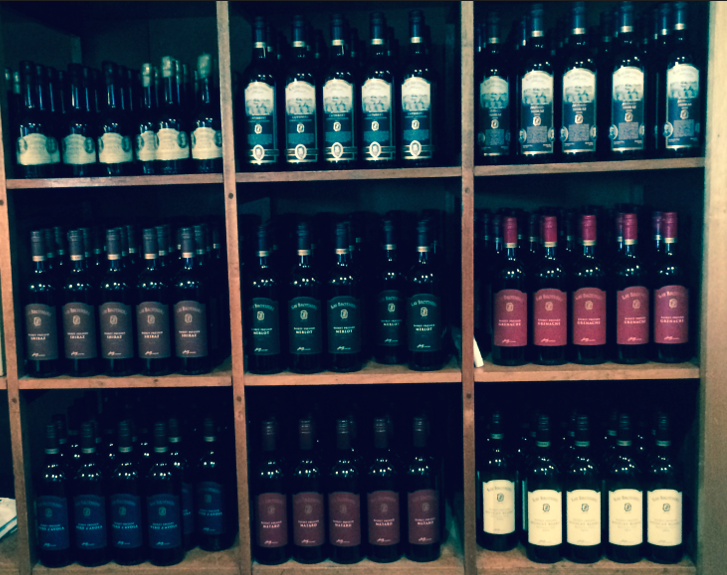 We are unanimous in our opinion: Mollydooker wines are most definitely YUM.